The Bajalia name is big part of my personal story. I spoke of my grandmother in an earlier post, but thought I would take time today to share about my maternal grandfather, Elisa Bajalia. He is the namesake for our company. 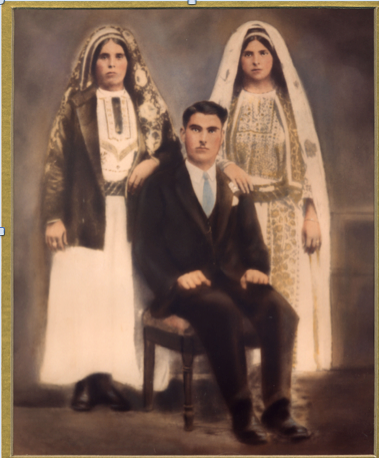 “Bajalia” comes from the city where my grandfather was born in Palestine, near Ramallah. The city is “Beit Jala.” “Beit” in arabic means “house” and “Jala” means “glory.” It is believed that this city, located in close proximity to a shepherds’ field in Bethlehem, was one of the first cities that “saw the glory” of the angels announcing the coming of Christ that first Christmas night, as told in Luke Chapter 2. This comment came to my memory one day while I was in India and I overheard a blessing being given to a woman: “May you be the mother of 100 sons.” In India’s culture, this is considered one of the greatest blessings a woman can receive. I must admit, hearing it made me sick. As I travel the world with awareness of all of the missing women, aborted girls, trafficked girls and violence to women, I remember my grandfather’s proud love and acceptance of women. My grandfather was one of the few who did not force any of his daughters to marry against their will, which was also rare for that time. He wasn’t perfect, but his love for all of us was of great comfort when so many other arab men in my life thought women were second class. The love and compassion of my grandfather took root somewhere deep in my heart. When so many others treated me as mere chattel, or even worse, as someone without a name and voice, he did not. I often think of my grandfather and the legacy he is leaving through his name as our company grows and people proudly announce the name Bajalia. It stands for so much, but to me it is a legacy of a man who loved women well and deserves to have his name carried forth in a radical and honoring way. I find it interesting that in each culture I visit, there exists a similar word or those I meet think this word, “Bajalia” is from their own language. I was told how in Hindi, it sounds much like a word that means “I am rescued,” so our company seems to have a name that resonates with many. My grandfather is no longer with us on this earth, but I think of how many people will hear his name and wonder about it as we near the fuller launch of our company and brand through HSN and beyond. I want the story to be told about a man who respected and loved his daughters and granddaughters when so many did not because he is certainly worthy of this kind of legacy to his name. I wonder who will be laughing at him now? After all, who knows what a son may have done to his name. I was sitting here wondering why you chose to use the name Bajalia for your company and stumbled upon your blog. This is such a cool story and an amazing thing you are doing to bring your Grandfather’s name honor. My Granddad (who is no longer with us) is a Bajalia as well and I know he too would super proud to see his name stand for something like this. Praying for your company and that God continues to bless!